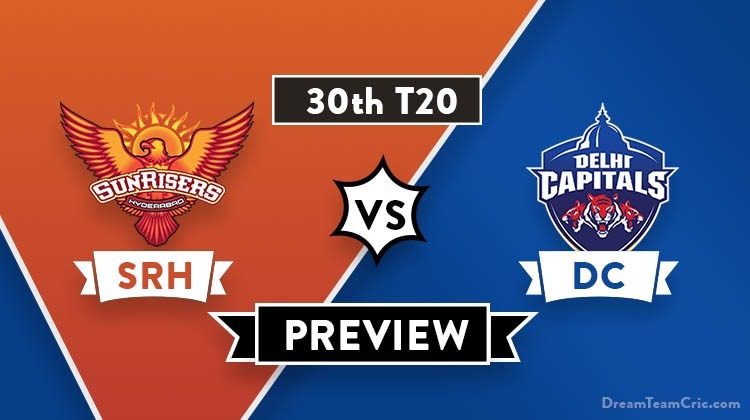 Hello and Welcome to our preview for Sunrisers Hyderabad vs Delhi Capitals match. We are covering SRH vs DC Dream11 Team Prediction, Preview and Probable Playing XI for the T20 match. The match is to be played at Rajiv Gandhi International Cricket Stadium in Hyderabad. Sunrisers Hyderabad is sixth on the points table with three wins and three losses. They lost their last match to KXIP by 6 wickets. Batting first, David Warner was the sole positive scoring 70* runs in 62 balls to take the team to a respectable total of 150. Defending the target, Sandeep Sharma took two crucial scalps and was supported by Rashid Khan but could not defend the low total for his team. With skipper Williamson likely to return in the mix, They will hope to solve their problem in the middle order and get back into winning ways. Delhi Capitals are fourth on the points table with four wins and three losses. They recently conquered RCB at Bengaluru and KKR at Eden Gardens and will be buzzing with momentum. They defeated KKR by 7 wickets in the last encounter. Bowling first, Pace trio of Rabada-Morris-Paul bowled exceedingly well taking two scalps each to restrict KKR at 178. In the chase, Shikhar Dhawan along with Rishabh Pant played match-winning knocks of 97* and 46 respectively to chase the target comfortably. They will hope to continue the winning momentum ahead and upset SRH at their home ground in Hyderabad. SRH VS DC, 30th T20, Indian Premier League, 2019. Rajiv Gandhi International Cricket Stadium, Hyderabad. Pitch behaved batting friendly in initial matches but was quite slow in the last encounter providing enough support to pacers as well as spinners. Kane Williamson (c), Bhuvneshwar Kumar, David Warner, Shreevats Goswami, Wriddhiman Saha, Jonny Bairstow, Martin Guptill, Manish Pandey, Yusuf Pathan, Deepak Hooda, Ricky Bhui, Abhishek Sharma, Vijay Shankar, Shakib Al Hasan, Mohammad Nabi, Rashid Khan, Shahbaz Nadeem, Khaleel Ahmed, Siddharth Kaul, Sandeep Sharma, Natarajan, Basil Thampi, Billy Stanlake. David Warner, J Bairstow (wk), K Williamson (c), Vijay Shankar, Ricky Bhui, Deepak Hooda, Rashid Khan, Abhishek Sharma, Bhuvneshwar Kumar, Khaleel Ahmed, Sandeep Sharma. Shikhar Dhawan, P Shaw, S Iyer (c), Rishabh Pant (wk), Colin Munro, Chris Morris, Axar Patel, Keemo Paul, Amit Mishra, K Rabada, Ishant Sharma. C and Vc Choices: C Morris, K Rabada, S Dhawan, Shreyas Iyer, Rishabh Pant, D Warner, J Bairstow, K Williamson, Rashid, Bhuvi. If you liked SRH vs DC Dream11 prediction, then follow us on Twitter for Latest Cricket News and Grand League teams.